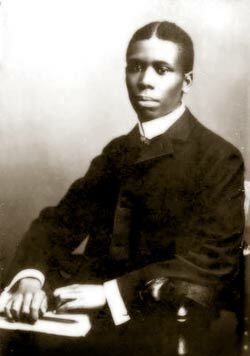 Paul Laurence Dunbar was the first African-American to gain national eminence as a poet. Born in 1872 in Dayton, Ohio, he was the son of ex-slaves. Dunbar penned a large body of dialect poems, standard English poems, essays, novels and short stories before he died at the age of 33 of tuberculosis in 1906. Paul Dunbar's style encompasses 2 distinct voices: the standard English of the classical poet and the evocative dialect of the turn-of-the-century black community in America. He was gifted in poetry -- the way that Mark Twain was in prose -- in using dialect to convey character. Dunbar had his first poems published in the school newspapers while attending Dayton’s Central High School. Orville Wright was a classmate. After his graduation in 1891, the only work he could find was as an elevator operator in Dayton’s Callahan Building. Many monotonous hours moving between floors allowed Dunbar’s poetic creativity to flourish. Between 1891 and 1892, Dunbar submitted his elevator poems for publication in newspapers and popular magazines with limited success. His first anthology, Oak and Ivy was printed in 1893 at a cost of $125 which he paid for himself. By 1893, he had recovered his initial investment, but that was about all. After this experience, Dunbar left Dayton for Chicago where he met abolitionist Frederick Douglass. While this meeting with Douglass had a big impact on Dunbar, he soon returned to Dayton and his elevator job. During this time Dunbar met Dr. Henry Tobey. Tobey was impressed with Dunbar's work that he loaned the struggling poet substantial amounts of money to help him out. Tobey even paid the printing costs for the publication of Dunbar's 2nd anthology of poems. Dr. Tobey circulated copies of the book among his friends. Eventually one of them wound up in the hands of William Howells, a nationally recognized literary critic. Howells wrote a glowing review of Dunbar's poetry in Harper's Weekly. Almost overnight Dunbar had become the most famous living African-American in the country. This was in 1896. In the next 10 years, would publish 4 collected volumes of short stories, four novels, 3 published plays, layrics for 13 songs, 14 books of poetry, 400 published poes and an uncounted number of essays on social and racial topics. This Italianate turn-of-the-century structure was the final home of the poet Paul Laurence Dunbar. It exhibits his literary treasures, many of his personal items and his family's furnishings. During his short lifetime Dunbar became known as the poet laureate of African Americans. Drawing on his observations of society and the experience of his parents--both former slaves--he gave voice to the social dilemma of disenfranchised people of his day and became a proclaimer of black dignity. Inside the house, exhibit many of Dunbar's literary treasures, his personal items and his family's furnishings. After Dunbar's death in 1906 his mother, Matilda Dunbar, continued to live in the house until her death in 1934. In 1936 the Dunbar house became the first state memorial to honor an African American. One of the items on display in the house is Paul's bicycle that was built by his friends Orville & Wilbur Wright. Paul Dunbar died at the age of 33 and was buried in Woodlawn Cemetery not far from the Wright family's plot.